We will pick you up at your hotel around 11:00 am and head to the Xenses Park where you will have 15 activities over land, air and water. Have fun through unusual scenarios that give you an unreal impression. An experience full of challenges for your mind, where all around you is not what it seems.. An experience full of challenges for your mind, where everything around you is not what it seems. 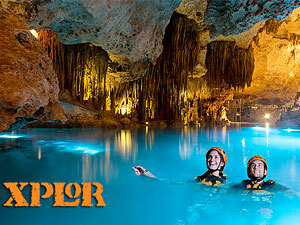 The second stop is the fantastic adventure park of Xplor, it is located only 5 minute away from Xenses. At Xplor Fuego you will join us in a expedition deep into the darkness of the mayan jungle where the night and fire will be your best companions... a challenge in the darkness like you never imagined. Buffet and unlimited beverages at Xplor Park (coffee, hot chocolate and multi-flavor water). Important at Xenses: Some activities included in this tour are not suitable for people with severe physical or motor handicap, serious heart problems, fear of heights, claustrophobia, persons with recent surgeries, back pain or who weigh more than 300 lbs. Zip-lines have a minimum height requirement of 4.5 ft and a minimum weight requirement of 88 lbs. Some activities are not recommended for pregnant women. Important at Xplor: About Zip-Lines: To ensure your protection and make sure the harnesses are comfortable and fit properly, a minimum weight of 40 kg (88 pounds) is required and a maximum weight of 136 kg (300 pounds) is allowed. The capacity in the harness circumference around the waist is 51 inches and 27 inches around each leg. The minimum height required for this activity is 1.40 mt. Amphibious vehicles: Only people over 18 years can drive the vehicles. It is essential that you present a valid ID proving your age. This tour is restricted to pregnant women, people with heart problems, diabetes, epilepsy, asthma, hypertension and claustrophobia. Children must be at least 5 to enter the Park. Children between 5 and11 years of age will pay 50% off adult ticket price. Must show official ID at the Parks ticket office. Pick-up is available for hotels located in Cancun, Playa del Carmen and Riviera Maya from Monday to Saturday from 11 am y 12:30 pm. depending of your hotel location Your pick-up schedule will be sent by email after booking.